The Amazon fulfillment centre in Brampton, Ont., on July 21, 2017. On the third storey of Amazon's towering warehouse in Brampton, Ont., 350-pound robots zip across concrete floors, picking up tall shelves of books, clothing or electronics and racing off to deliver them to human sorters. A 10-kilometre web of conveyor belts ferries thousands of orders from one workstation to the next, while robotic arms stamp labels onto the boxes and workers scan and package items. The robots, which look like giant orange Roomba vaccums, travel underneath the tightly packed shelves and wirelessly communicate with one another to move products around like a game of Tetris. 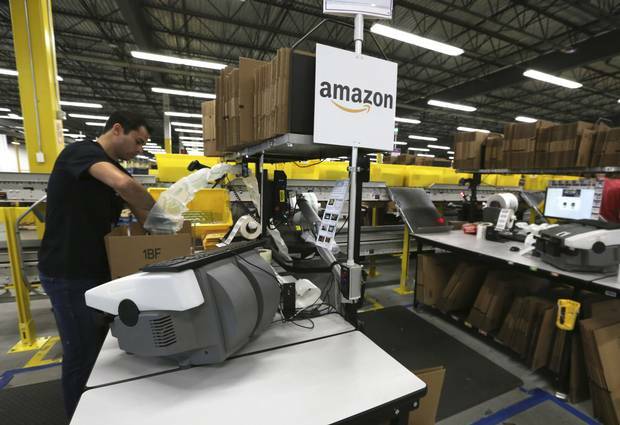 The intricate, high-tech process allows the facility to store twice as many goods as other Amazon warehouses, and handle twice as many orders every day. "Processing time using robotics went from what would take up to several hours to mere minutes, enabling faster ship times," said Glenn Sommerville, Amazon's director of operations in Canada. The 850,000-square-foot building, which opened a year ago, is Amazon's fourth warehouse in the GTA, and sixth in Canada, since the online retail giant entered the domestic industrial real estate market in 2011, quickly becoming one of the country's major warehouse tenants. In only six years, Amazon has leased over 2 million square feet of warehouse space in Canada to serve the booming demand for online shopping, putting the company at the cutting-edge of an e-commerce revolution that's not just changing the world's retail landscape, but is also making once-dull warehouses the hottest thing in real estate. Demand for warehouse space is soaring as retailers of all stripes – from giants such as Amazon to small specialty retailers – ramp up their online sales operations based out of distribution complexes on the outskirts of major cities. Prices are surging as retailers compete to secure prime buildings in strategic locations near large populations and transportation hubs. In Toronto, which is North America's third largest warehouse market with 43 per cent of Canada's total inventory, average net rents have climbed 9.7 per cent in the past year alone, according to CBRE Canada, while vacancy rates have plunged to a record-low 2.7 per cent as of June. In Vancouver, where warehouse rental rates climbed 5.1 per cent in June compared to a year earlier, the vacancy rate for industrial space was sitting at just 3 per cent in June, CBRE said. "We're searching for a client right now who has a fairly basic requirement. They need 60,000 to 70,000 square feet and they want to be in a new facility," said Bart Vanstaalduinen, an industrial broker with Cushman and Wakefield in Vancouver. "We've only got four options in the entire metro Vancouver market for occupancy for the fourth quarter of 2018." As consumers change the way they buy products, the impact is rippling up the supply chain, impacting how goods are moved and stored. Industry analysts estimate e-commerce accounts for around 6.5 per cent of retail sales in Canada, including international shipments. Many expect that to catch up to U.S. levels, which are in the double digits. The rapid growth has forced companies to rethink their warehousing strategy in order to get closer to customers and speed up delivery. This in turn is changing the industrial real estate market, how companies build, and where investors put their money. Kyle Hanna, senior vice-president of industrial properties at CBRE Canada, said many retailers are only now hitting a critical mass with their e-commerce sales and can no longer run their online operations from existing space. "What retailers have been doing for the past five or seven years is just running a small e-commerce component inside their traditional distribution centres, but now we're seeing them really looking at having these dedicated buildings or expanding into a much larger footprint because the e-commerce component is the part that's growing the most," he said. Across Canada, e-commerce still accounts for only 12.9 per cent of industrial property use, but the demand is expected to grow quickly over the next five years. 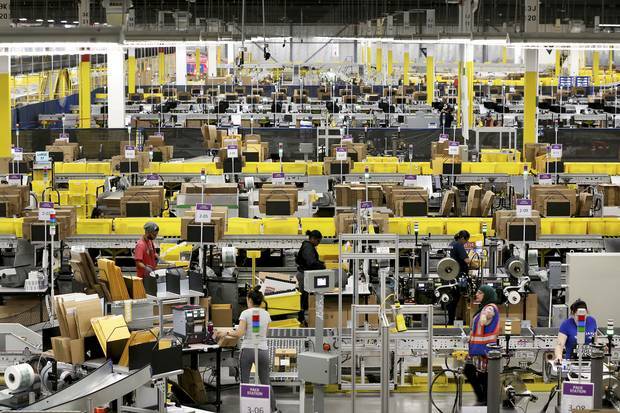 In Toronto, 23 per cent of industrial space is already e-commerce-related, according to CBRE. Research by CBRE shows every $1-billion of new online sales per year requires an additional 1.25 million square feet of warehouse space. With online purchases in Canada forecast to grow from $34-billion in sales in 2016 to $56-billion by 2021, warehouse space demand needs to grow by 27.5 million square feet in five years just to match that demand – a level far outstripping current new construction. Mr. Hanna, who heads CBRE's e-commerce specialty group, said more than 75 per cent of new warehouse construction projects in the Toronto region are currently being done on speculation without a firm tenant booked for the space, an increase from less than 50 per cent just a year ago. "It just really shows the strength and the investor confidence in the demand," he said. Not all warehouses have robots zipping around and conveyor belts flying, as with Amazon. But the demands of e-commerce warehousing are different than for warehouses servicing traditional retail stores, said Ben Conwell, senior managing director of Cushman and Wakefield's e-commerce division. "Store replenishment is big pallets, cases of goods that come into a warehouse and they leave as pallets or cases. Compare that to the online direct-to-consumer world where the fulfilment model is cases or pallets coming into a fulfilment centre … but you have one pair of boots going out, one set of earbuds going out." E-commerce warehouses are designed to accommodate the larger work force needed to sort and ship individual parcels. The Amazon robotics centre in Brampton, for example, employs 700 people less than a year after opening. That number is expected to rise to 900 by the end of the year, and similar facilities in the U.S. employ up to 3,500 people. Products are packaged at Amazon fulfillment centre in Brampton, Ont., on July 21, 2017. The warehouses also need bigger power sources due to increased automation, as well as back-up systems to ensure the power never goes down. They're also taller with reinforced floors to allow stacking while taking advantage of land space. In Amazon's Brampton facility, that means a building close to 45 feet tall with four floors, each holding thousands of shelves of goods. Data from CBRE shows taller warehouse space is growing quickly as a result of the e-commerce boom. In the second quarter of 2017, almost three-quarters of new big-box warehouse properties under construction in Canada had a clear height of 32 feet or higher, up from 50 per cent just one year earlier. CBRE said 10 years ago, the tallest warehouses being built in Canada were 26 feet. With many e-commerce tenants looking for specific types of purpose-built warehouses, the demand is far outstripping supply. And that imbalance is drawing major investors into the sector, including many of Canada's largest pension plans, which have announced a flurry of deals in recent months to buy industrial properties as they pare sagging retail holdings from their real estate portfolios. The result is record sales prices. In Toronto, the average sale price of warehouses jumped 19.1 per cent over the past year from $119.35 per square foot to $142.19. Average sale prices have climbed 63.3 per cent since the second quarter of 2014. Toronto-based pension fund OPTrust has built a $490-million portfolio of industrial properties over the past five years, which now represent 17 per cent of the fund's total real estate portfolio. OPTrust CEO Hugh O'Reilly said warehouses are ideal long-term investments for a pension fund because they not only climb in value, but also generate monthly income. "These assets in particular fit a pension fund's perspective on what is an awesome asset because they also generate consistent cash flows," he said. Concert Real Estate Corp., which invests in real estate for a group of Canadian pension plan owners, has also made a huge bet on warehouses, assembling a portfolio of 8 million square feet of commercial and industrial properties across Canada. Concert's commercial real estate investment fund – CREC Commercial Fund LP – spent $158-million in April to buy a new 895,000-square-foot warehouse facility on a 37-acre parcel of land on Torbram Road in Brampton, west of Toronto. Tenants include Mountain Equipment Co-Op and TJX Companies, parent of Winners and Home Sense. The price wasn't cheap, but Concert chief executive officer Brian McCauley said one of the key appeals of the new building was its 38-foot ceiling heights, which are higher than traditional 20-foot warehouse buildings. While warehouse space has traditionally been bought and leased based on two-dimensional square footage, Mr. McCauley believes height and the additional volume it provides is going to become a key factor in the warehouse market in the future because it maximizes expensive land. "With advancements in racking systems and other things now, you can actually go higher and store product higher," he said. "It's easy to do – there are all kinds of mechanized and automated storage systems now that are available, and that's really helpful because you can buy less land and build a small building, but a taller building, and get the same utility out of it." Ivanhoé Cambridge, the real estate investment arm of the giant Caisse de dépôt et placement du Québec pension fund, has also launched a foray into the sector, announcing its first big warehouse investment last week. The company bought U.S.-based Evergreen Industrial Properties for $1.3-billion, acquiring a portfolio of 160 properties with a total of 16 million square feet of warehouse space in 18 major markets. Arthur Lloyd, who heads the North American office group for Ivanhoé Cambridge, said institutional investors overall have been slower to move in the warehouse space, but are increasingly attracted by low vacancy rates, growing rent levels and the comparatively low capital requirements to maintain and operate warehouse buildings. "They offer a higher current return than other real estate asset classes," he said. The next frontier in warehouses are "last mile" distribution hubs that can help online retailers make same-day deliveries from smaller and more central warehouse locations. For large online retailers, the last mile hubs are a complement to bigger automated plants that are typically farther out of the city, closer to airports and major highways. These hubs are at the heart of Pure Industrial Real Estate Trust's strategy. Over the past four years PIRET – the largest industrial real estate investment trust in Canada, with 150 buildings across the country and 75 in the GTA alone – has been expanding its holdings in last mile distribution for companies such as FedEx and IKEA. E-commerce-related properties now make up about 30 per cent of the company's portfolio. "These fulfilment centres tend to be much smaller, around 100,000 to 250,000 square feet. And instead of having inventory stored for days or months, these fulfilment centres will turn over their inventory in one day, sometimes twice a day," said president and CEO Kevan Gorrie. PIRET's centres are mostly mid-sized warehouses on the outskirts of the city near Pearson Airport or in nearby Etobicoke. But there may soon be even smaller hubs located right downtown. "The area where we see the biggest percentage growth coming in the next five years is in the whole area of last mile real estate, last mile delivery stations. These are very small, they can be 5,000, heck they can be 4,000 square metres up to maybe 10,000 square metres," said Mr. Conwell of Cushman and Wakefield. "They will be built into a very small, multi-tenant space, in central GTA," he added. "What Amazon does in the New York metro, and what we'll continue to see in the GTA, is large buildings on the periphery feeding a small last mile centre that might be right in the urban core."